At Hydroblast we offer our water jet road marking removal services to the whole of the United Kingdom and offer minimal callout fees. It doesn’t matter if the job that you want completing is large or small we can cater to almost any sized project. 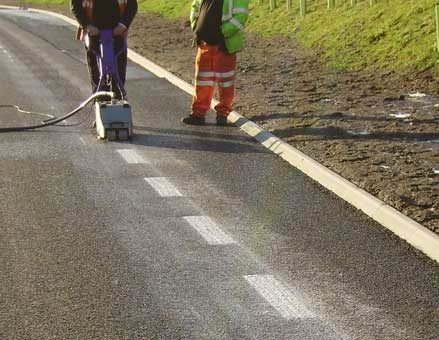 One of the great things about our road marking removal is the fact that there are no harsh chemicals, abrasives or substances used. This means that it can be used to remove playground markings and can be used to allow us to carry out road marking removal indoors and outdoors. Our machinery is small and nimble, allowing us to complete line removal tasks from hard to reach areas. The machinery we use is perfect in the case of sorting mistakes quickly such as; airports, schools, zebra crossings, small scale road markings and car parks. Trying to remove road markings without the proper equipment can be very difficult. Even if you have the equipment you still need to have experience in providing an effective result. Road markings are designed to be a permanent feature on the road and they’re thermoplastic, so they can’t simply be washed away. If you need a company that can either supply you with the equipment and training to carry out road marking removal on your own or one to complete it for you then we can help. Hydroblast is able to remove most colours of road markings such as red, white, yellow, blue, and more. Our top of the range electronically controlled machines can be set to propel itself backwards and forwards. This means we can cater to a number of customer requirements and accommodate every need, whatever size of area or location you have.